How can I prevent pollen from overtaking my outdoor space in Charlotte? Are you tired of pollen’s green/ yellow dust taking over your car, house, deck, and porch? You can do something now about your porch! EZE Breeze windows from PGT Industries are the perfect remedy for your porch. These are retractable vinyl paned windows that are built with a powder-coated aluminum frames. EZE Breeze windows convert your screen porch into a sunroom and right back to a screen porch by simply opening and closing the windows. They can open up and down or sliding operations. They are remarkably durable and also block out wind, rain, and dirt when they are kept close. They are constructed with a very good screen system and come in a variety of colored frames and tints to the panes if desired! Go to http://www.charlotte.archadeck.com to see a complete photo gallery! What are the best ways to winterize your outdoor living space or porch? There are several ways to extend the time you are able to spend outdoors, specifically in the Carolinas! The most popular way to winterize your outdoor living space is by adding a fire feature. This could mean something as simple as a fire pit or a real focal feature like an outdoor fireplace. 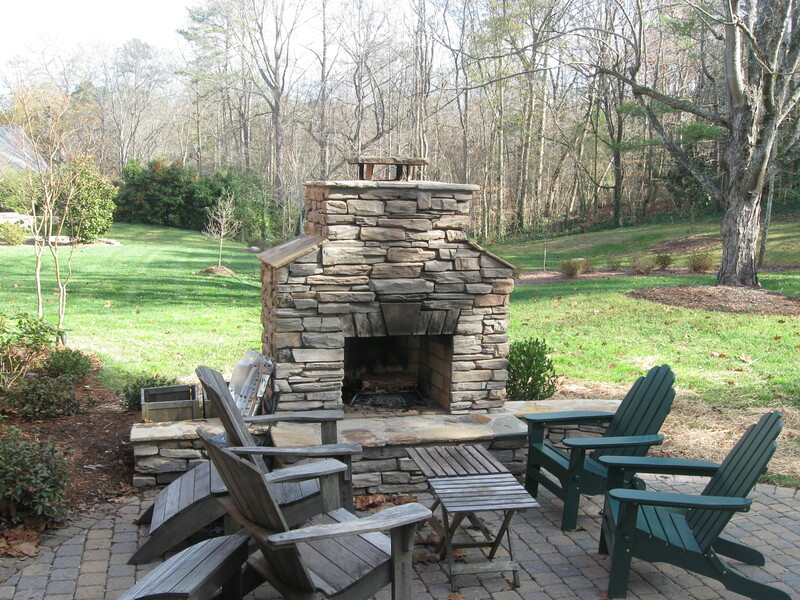 If you have a covered patio or screen porch, you can even have the outdoor fireplace integrated into the structure. PGT Industries has been manufacturing its Eze Breeze window porch enclosure product for years now. In the greater Charlotte area, these are a wonderful to enclose your porch and with the aid of an outdoor fireplace or space heater, you can be outside year around. What are those plastic porch windows I keep hearing about? 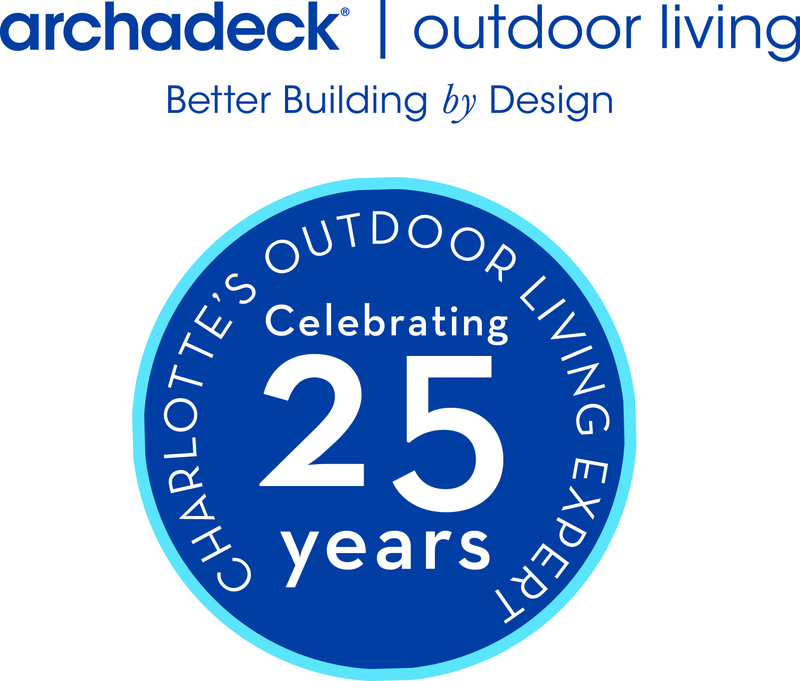 At Archadeck of Charlotte, we keep getting the same question about screen porch windows or plastic porch windows. The leading brand and manufacturer of screen porch windows is Eze Breeze from PGT Industries. Eze Breeze windows are made of a memory vinyl that is warranted not to yellow or crack over time. They do a great job of keeping the pollen off of your screen porch. Other benefits include keeping the porch mostly dry, keeping airborne dirt out, and knocking out the wind. 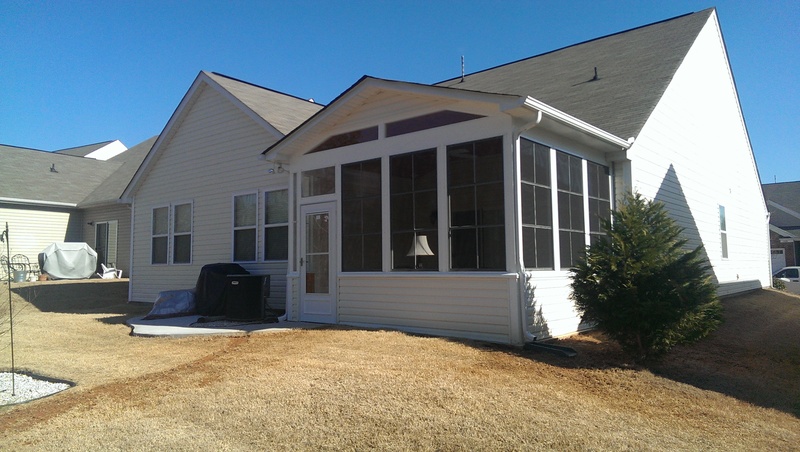 In addition, by simply sliding the windows down, you have your screen porch back again. 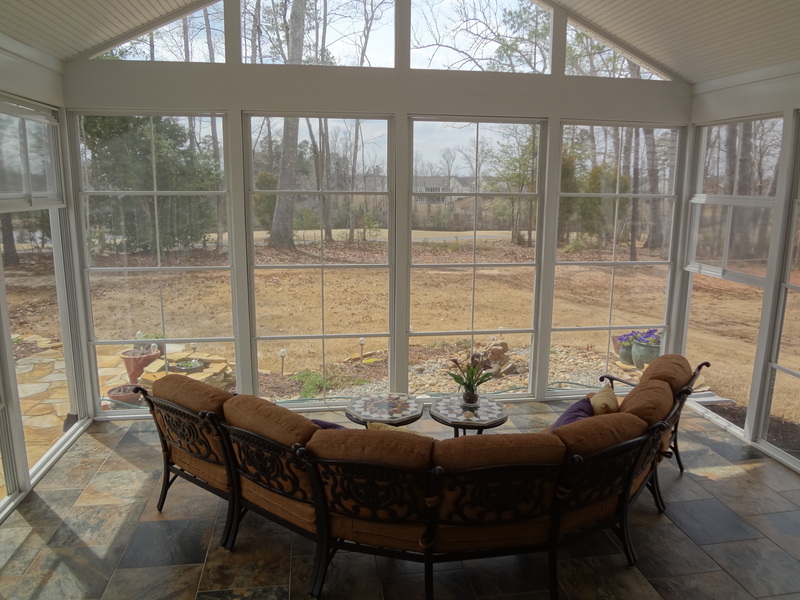 We think of Eze Breeze as a unique product that can convert your screen porch into a sun room and then right back again. They are custom made and can be installed into existing screen porches and retrofitted. They also come in a variety of frame colors and the panels can even be and can even be tinted. For more information and great ideas, go to www.charlotte.archadeck.com . 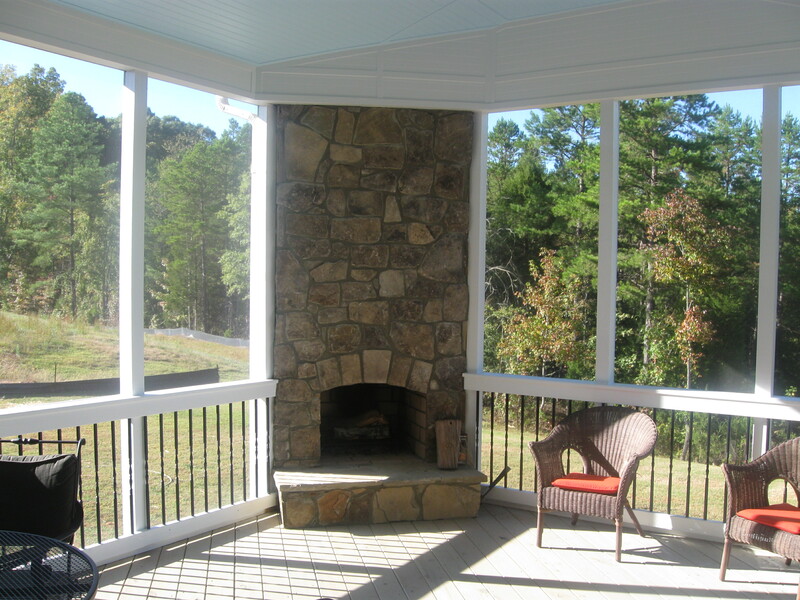 For more screened porch pictures, visit our porch photo gallery. How many months a year can I use my screen porch in Charlotte? 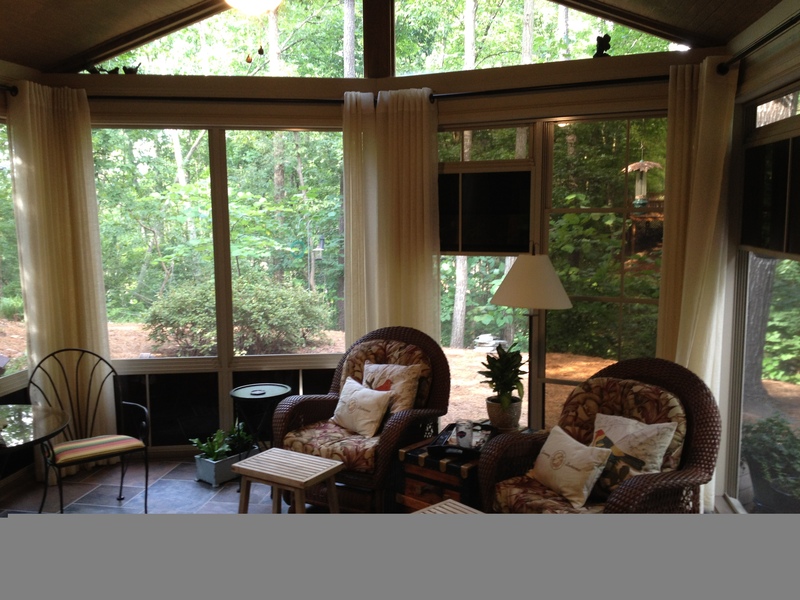 We get asked often how many months out of the year can you use your screen porch in the Charlotte, NC area? There are a few factors to consider when answering the question. Is your backyard situated where you have no protection from wind? Do you get sun light on your porch? Have you installed a ceiling fan to circulate the air flow? A great product that we distribute is Eze-Breeze windows that are retractable plastic windows that can convert your screen porch into a sunroom and right back again. The primary difficulties of staying on your porch year around are the extremely cold days and hot days. To mitigate the heat, you can of course add ceiling fans or perhaps a mister system like are used at restaurants on their patios. 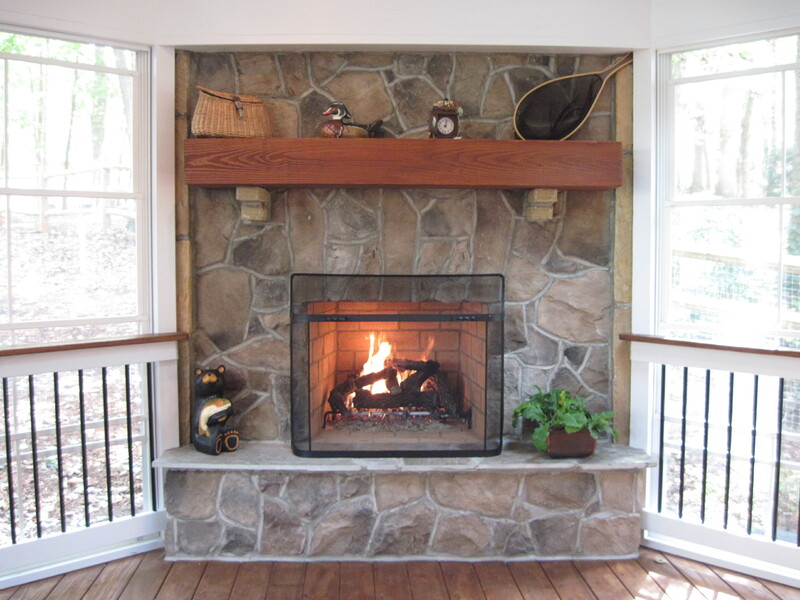 To mitigate the cold, we often build outdoor fireplaces that are integrated into the screen porch. You can also purchase space heaters that are effective.